April 11, 2017 4:35 pm. The Group 1 All Aged Stakes is a weight for age horse race, over a distance of 1400m at Randwick. While it is not part of The Championships, the All Aged Stakes, along with the Champagne Stakes is run on the Saturday after day 2. The All Aged Stakes has an all-star cast of past winners, including New Zealand superstar Sunline (2000, 2002), Atlantic Jewel (2012), Racing To Win (2008) and Rough Habit (1992, 1993). In recent times legendary Sydney trainer Gai Waterhouse has the race her own with All Our Mob (1997), Arlington Road (2003), Shamekha (2005), Bentley Biscuit (2007) and English (2016) making it five wins. The All Aged Stakes is a popular betting event in Australia and forms the centrepiece of the unofficial Day 3 of The Championships. This means all registered Australian bookies will have extensive markets available on the race in the lead-up including an all-in market. This means you can bet on the race weeks in advance and get some juicy odds on a horse which may not have shown its best cards yet. After a second placed finish in the TJ Smith Stakes, Godolphin sprinter Osborne Bulls is the $3.50 favourite at online bookmaker Ladbrokes to win the All Aged Stakes. D’Bai ($3.80) is on the second line of betting while Pierata is at $4.50. Malaguerra and Le Romain are locked together at the $8. It was Pierata’s day on Easter Saturday this year as the sprinter finally broke through for a huge Group 1 win. Travelling smoothly in transit Pierata was taken to the front at the 200m and quickly dashed clear, with race favourite Osburne Bulls getting out late to finish behind the tearaway winner. 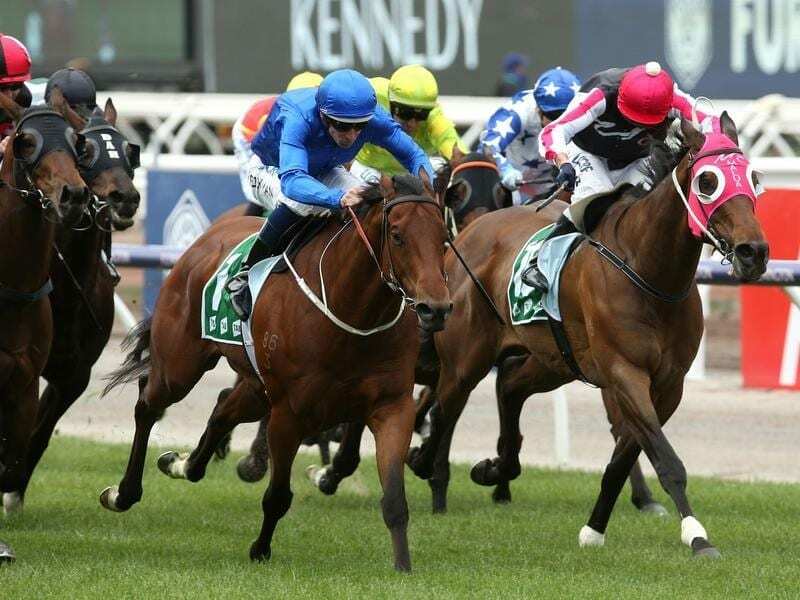 There were a few concerns that Trapeze Artist would struggle under the weight of favourtism after winning the TJ Smith, and the Gerald Ryan runner looked to be in strife coming into the 400m. The gun colt found extra in the final stages however, condemning Le Romain to a second-straight All Aged Stakes runners up cheque.Read report here. The Michael Moroney-trained Tivaci defied a leaders bias to come from last to win the 2017 All Aged Stakes. The talented miler gathered momentum down the outside with Damien Oliver in the saddle and it reeled in the likes of English and Le Romain, which finished second. Heavy track specialist Jungle Edge battled into third. Read report here. Gai Waterhouse made it five wins in the All Aged Stakes as English ($6) took out the 2016 running from Black Heart Bart ($6) and Kermadec ($5). The filly became the first filly since Atlantic Jewel to beat the older horses in the race and just the third three-year-old in almost 90 years to win it. Expertly guided by young jockey Sam Clipperton, English got on the heels of favourite Press Statement and barrelled home for a neck victory. Dissident ended his racing career with a victory worth $400,000 in the All Aged Stakes for Peter Moody, who enjoyed a remarkable day with three wins. Ridden by veteran hoop Jim Cassidy, Dissident ($10) beat home the Gai Waterhouse-trained Wandjina ($7.50) and Chautauqua, who was the $3 favourite. It was a forward showing for Dissident, who sat on the outside of Wandjina, before proving too strong in the final few hundred metres. Hana’s Goal notched one up for the Japanese with the mare one of two international horses in Sydney for the Autumn, the other being Lord Byron, which also won a group 1 race. Hana’s Goal produced a promising run in the Doncaster Handicap a fortnight earlier which convinced connections to extend the Australian stay. Ridden by Nash Rawiller, Hana’s Goal came from last to first the $10 shot proved too strong for Weary ($5.50) and Tiger Tees $7. $2.20 favourite Rebel Dane finished well back in fifth after failing to kick on. All Too Hard, a half brother to legendary mare Black Caviar, showed a devastating turn of foot over the final 250m to win the race from Rain Affair and Fiorente. Trained by the Hawkes Stable, All Too Hard proved in a different class to a magnificent field despite not being at full fitness first up. The horse was notable for it being the spark that ignited the war between More Joyous owner John Singleton and Gai Waterhouse – the pair eventually making up. Atlantic Jewel showed just how good she is as she became the first filly in 86 years to win the group 1 race. Sent out at $1.12 Atlantic Jewel had its work cut out at the top of the straight, but eventually run down Rain Affair ($7.50) and roughie Ofcourseican ($61). It took Atlantic Jewel’s record to seven starts for seven wins but was definitely her most challenging outing.